It is generally considered to be of no real clinical significance and is just an observation that is made. There are plenty of questions in forums about it, but it is often misunderstood. It is related to “overpronation”, so its management and clinical significance are related to the issues surrounding that. The Short Foot Exercise is something that is often promoted as a cure all for so many foot ailments. 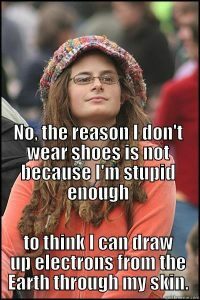 Its not. It is a useful tool. The exercise is useful for what it is designed for: to strengthen the intrinsic muscles in the foot. That is all. Nothing more and nothing less. It does not cure all the ails the foot, despite the claims by many of it supporters. It supposed to “cure” “overpronation” – it dosen’t. The evidence is clear on that. I can be useful in plantar fasciitis. This is a condition in which the fascia that surround the muscles on the anterior part of the leg appear to be tight, so that during exercise when the muscle tries to expand, it can’t. This can become painful and gets known as anterior compartment syndrome or chronic exertional compartment syndrome. Typical the only satisfactory treatment for this has been a surgical release of the fascia as conservative treatments never seemed to work very well. 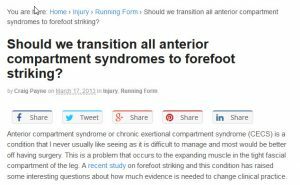 This topic has been generating a lot of interest lately due to the using of changing the running gait appearing to be very successful at managing this. The trend has been to use forefoot striking rather than heel striking and shortening the stride length and increasing the cadence. A non-controlled study show that this is to be very effective and a lot of good clinical experience is supporting it use. Grounding or earthing is junk science from the the alternative health movement that is based on the absurd belief that we need to be barefoot in contact with the earth to keep our ‘electrons’ in balance. If our ‘electrons’ are out of balance, then you get a whole range of health problems. If you can’t go barefoot on the earth, then sellers have some products to sell to help facilitate that grounding. Those that promote the concept have a financial interest in the concept! The whole concept is biologically and physically impossible. The way that claims are made break some basic laws of physics. It is made up quackery and woo. The claims are bogus. For example you see claims that ‘electrons’ from the earth are better than the one in our own bodies! Electrons are electrons! They are the same wherever they are. The research it is based on is biased and bogus. Posterior Tibial Tendinitis is not a common tendonitis, but typically occurs in runners. The main symptoms are either/or swelling and pain just above or below the medial malleolus. This is an overuse injury so the cause is when the load over time in the tendon exceeds what the tendon can take, usually when not enough time is given for the tendon to adapt to changes in load. It is typically associated with ‘overpronation’ if the forces of pronation are high. This rant on video from Podiatry Soapbox a good overview of the condition and how it should be treated. The management is not that difficult provided common sense and a logical sequence of events is followed, yet have been a lot of questions in forums and Q & A websites (eg here, here and here) with a mixture of the quality of advice being given online. One of the biggest problems with posterior tibial tendonitis is runners is that in many places they confuse it with posterior tibial tendon dysfunction when they are two totally different beasts. This is a concept that has been getting increased attention in recent years in clinical practice. It is a concept and clinical test of determining how hard it is to supinate the foot based on the assumption that the harder the force is, then if a foot orthotic is needed for something like, overpronation, then more force needs to come from the foot orthotic; so a rigid firm and inverted type foot orthotic is needed. Similarity if the force is low, then not much force is needed from the foot orthotic, so a soft flexible foot orthotic is indicated. There has been some research done on it, but not a lot. This is probably limiting its more widespread use in clinical practice. The test for supination resistance does correlate quite well with some pathologies and not others. Severs disease is a common problem of the heel in children. It occurs when there is too much load on the cartilage growing area at the back of the heel bone leading to a condition that is possibly similar to a stress fracture. The classic symptoms are pain at the back the child’s heel, that is also painful to lateral squeezing at the back of the heel. The condition is self limiting as the growing area joins to the rest of the heel bone by the mid-teenage years. However, that is no reason to not treat it as its is painful and does affect quality of life. The approach to it management to to treat the symptoms with some pain relief (ice, Oscon, anti-inflammatory drugs) and load management. Load management is related to things like heel raises to protect the painful area and a reduction of activity levels. In the child, managing this can be difficult as they like to run around and play. As the condition is self-limited, these control of pain and load management may be all that can be done over the long term until the natural history of the growth area is to merge with the rest of the heel bone. The windlass mechanism is an extremely important function in the foot. It is the foot’s own natural arch supporting mechanism, so any inhibition of this mechanism is going to affect the integrity of the foot and it biomechanics. The plantar fascia or plantar aponeurosis attaches to the bottom of the heel and the base of the toes, so spans the arch of the foot to support it. When the heel lifts off the ground the toes bend relative to the metatarsals, so they tighten this plantar fascia, giving stability to the arch and foot during the propulsive phase of gait. If there is any issues that affect the integrity of the windlass, then there are often consequences. The arch of the foot will not be able to resist the forces that are applied to it during propulsion and will collapse. This can result in a range of different pathologies such as plantar fasciitis. Also while not being able to support the arch will also contribute to any overpronation and the consequences of that. If there is any sort of dysfunction of the windlass there are a number of different types of interventions that can be used such as lowering the force to get it established or to get the windlass to initiate or start working earlier. Plantar fasciitis is common and like any other problem that is common there is so much snake oil that gets marketed for it and bad advice that gets given for it. Because of this, so many cases get mismanaged and what should be an easily managed condition become a chronic difficult to manage problem. The classic symptoms of plantar fasciitis is pain under the heal that is generally worse when getting up from rest. If you have those symptoms, then there is a pretty good chance that this is what it is. However, there are a few uncommon problems that can produce the same symptoms, hence the need to getting the diagnosis right. There is nothing wrong with self-diagnosis or self management as the simple cases are easy to treat. However, you do need to be aware that not getting one of the more uncommon conditions diagnosed and treated early can lead to a lot of unnecessary pain and discomfort. Plantar fasciitis is due to too much cumulative load in the plantar fascia beyond what the tissue can take. This means that the basic treatment has to be directed at reducing the load and increasing the ability of the tissue to take the load. Any other treatments are just directed at the symptoms and not at these basics make a lower probability of success over the long term. There is so much differing advice been given of differing quality that may or may not be based on the most recent available evidence. Some of the advice is good and some bad. Whatever is going on with your plantar fasciitis, get the right diagnosis first and get the treatment that the scientific evidence has been shown to work better than a placebo, rather than rely on anecdotes and poor quality non-evidence based interventions. Overpronation is a term that is widely misused and abused outside the podiatry profession. This is especially true in running communities where is is often the basis that underpins the manufacture and use of running shoes. Running shoes are typically designed or mild moderate or severe pronators. The evidence that supports this concept is either very weak or nonexistent. The evidence that shows overpronation is a risk factor for injury in runners is that it is only a very small risk factor. The evidence that running shoes should be prescribed based on the amount of pronation, is that this is not supported. Pronation is a normal health motion in which the ankle rolls inwards and the arch collapses. Overpronaton is obviously when there is too much of this. No one really knows how much is too much and there are plenty of people who have a lot and have no problems. A lot has been written on the nonsense and myths. At the same time, there are many people pretending to be gurus on this topic when they clearly do not understand it. There is so much bad advice on the web on overpronation, but also some good advice. Pursing information on ‘overpronation’ on the web means using your critical thinking skills. Check the source. Check the credibility of who is posting the information. Don’t just believe something because it supports your preconceived biases.